The Red Canyon Section of the 118 mile long Paradox trail begins off of Highway 141 between the towns of Gateway and Naturita, Colorado. From the highway the route crosses the Dolores River and follows the R13 Road around Biscuit Rock to the mouth of Red Canyon where it travels up an old mining trail through Red Canyon until it tops out on Carpenter Ridge overlooking the Paradox Valley. 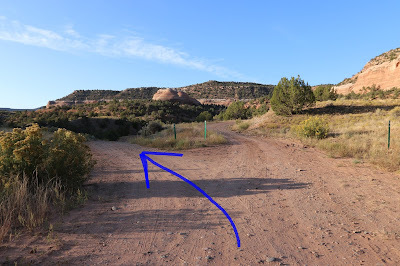 When the Paradox trail reaches Highway 141 at Mesa Creek it travels down the highway for just under 2 miles before branching off on the right at a point that is about 27 miles south of the town of Gateway and 24 miles north of Naturita. The trail follows Q13 Road across a bridge over the Dolores River where it begins climbing a hill. After a short distance the trail takes a left fork and branches off onto the R13 Road. 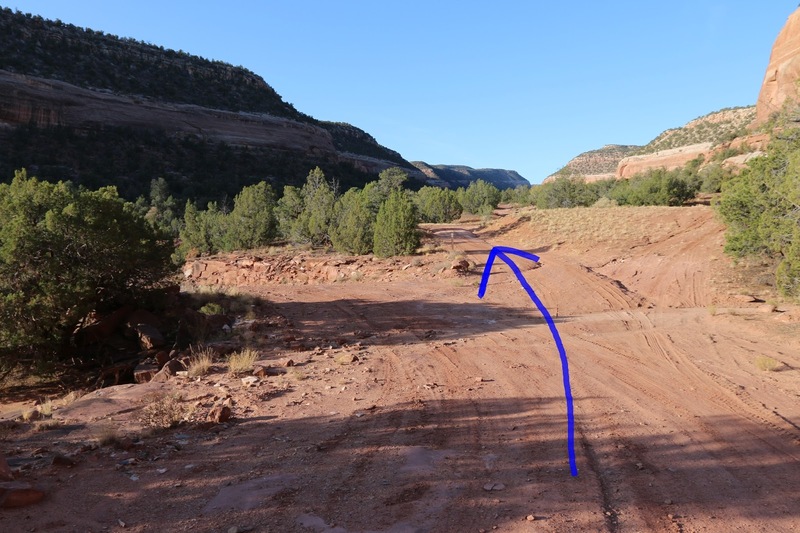 The R13 Road travels south along a bench on the west side of the canyon above the Dolores River where it passes by a prominent sandstone formation known as Biscuit Rock. There are several nice primitive campsites through this area. Around the 1.75 mile point from the highway the Paradox trail leaves the R13 Road and enters the lower end of Red Canyon. There are a few stretches where the trail is smooth and travels fast and easy. But there are also plenty of places where there is uneven slickrock, small ledges and loose rocks. The elevation profile shows the steady uphill climb from Highway 141 on the left to Carpenter Ridge on the right. There are very few dips where any elevation gain has to be re-earned. The crux of the trail comes up just past the 5 mile point where the trail climbs out of the canyon up a steep rock strewn hill. The redeeming quality of the troublesome talus is that it only lasts for about 1000 feet before it begins leveling off. There are a couple more spots that are either ledgy or rocky that might require a hike a bike for some riders but they are much shorter and less steep. By the time the trail reaches the 6.5 mile point it is all the way out of the canyon and heading down Carpenter Ridge where the Paradox Valley can be seen below. At the 7.3 mile point from Highway 141 the Red Canyon Section of the Paradox trail meets back up with the Q13 Road and comes to an end. As you might have guessed by now this opens up the possibility for a loop ride by combining Q13 with the Red Canyon route. The loop of course might be a lot easier to ride in the opposite direction by coming up Q13 and going down Red Canyon. Q13 Road is right at 6 miles from the highway to this point so the entire loop would come out to 13.3 miles. When we took the photos for this post we opted to just turn around and ride back the way that we came. Going in that direction the entire trail is rideable and goes by incredibly fast. It took us almost 3 hours to come up the trail, stopping 126 times to take a picture, and only about an hour to blast back down it. That was even with one quick stop on the way down to give the arms and shoulders a rest. 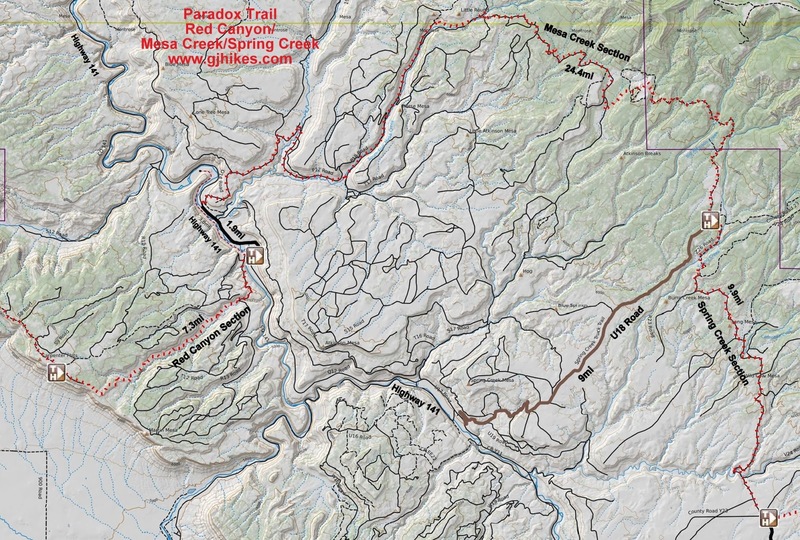 Whether you are doing the entire Paradox trail, the Red Canyon section as a loop, or as an out and back it is a good place for an enjoyable time. If you would like to see it for yourself then all you have to do is grab your bike or 'Take a hike'.